Four classic Dreamcast games are heading to a console near you. Not every console though, and you might have two of the games already. Sega announced that it was working on a Dreamcast retail collection last month, prompting squeals of excitement from the console's dedicated fan base. Fast forward to today, however, and the details of the collection may turn those squeals from delight to dismay. Sega's Dreamcast Collection will contain four games: Sonic Adventure, Space Channel 5: Part 2, Crazy Taxi and SEGA Bass Fishing. Each game will receive some extra spit and polish in the graphics department, as well as online leaderboards and achievements. If that particular quartet of Dreamcast games seems familiar, and you're scratching your head trying to figure out why, then ponder no longer. It's because they've also all either been announced as downloadable titles for XBLA and PSN, or are already available. Space Channel 5: Part 2 and SEGA Bass Fishing are due for release in the not too distant future, and Sonic Adventure and Crazy Taxi have been available since September and November respectively. Still, their availability elsewhere may actually be a good thing, at least for PS3 owners, as it looks like the collection is Microsoft only. The official press release for the collection prominently mentions the Xbox 360, and also gives the PC a quick nod, but leaves the PS3 out in the cold. There's every chance that it will come out on the console later, but there's no clue as to when that might be, if it does actually happen at all. Hopefully, this is just the first instalment of Dreamcast classics we can look forward to, as there's plenty of titles that people would love to play again, not to mention titles they haven't already bought. 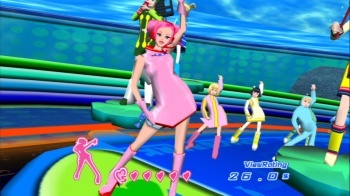 Sega's Dreamcast Collection comes out for Xbox 360 and PC on February 22nd in North America and February 25th in Europe. Hopefully a PS3 release will follow on soon after.